I had a sumptuous meal last night having a macaroni salad from Greenwich and a vegetable salad I bought from the grocery. Bearing this in mind, I want to have a healthy breakfast for my tummy this morning. I still have leftovers so I decided to make a sandwich out of it. I was advised to eat vegetables and a folate reach bread. Of course, Gardenia is a big CHECK for this. Since I still have extra loaves in my shelf, I started to prepare a healthy breakfast sandwich, great for expecting moms like me. 1. Take two slices of Gardenia Bread. 2. Put the 1 leaf of lettuce, and top it up with macaroni salad. 3. Add a slice of pipino and coleslaw. 4. Spread the salad dressing or mayonnaise on the other half of the bread. 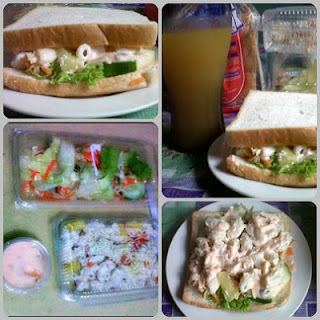 Easy to do healthy sandwich from Gardenia and macaroni salad leftovers right? Sure kids would love it too for their baon at school or prepare this sandwich for your husband on the go.